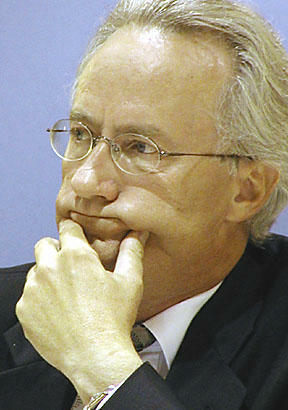 An Armchair Mayor column by Mel Rothenburger published in The Kamloops Daily News on Sept. 8, 2012. EACH WEEKDAY MORNING, university students exit the apartment buildings squeezed like building blocks between Columbia Street and Summit Drive, and head towards TRU. Many, maybe even most, eschew the crosswalk on McGill Road and, instead, run the gauntlet of heavy traffic streaming up and down Summit Drive. One estimate of a few years ago was that 40,000 of them make this dangerous pilgrimage every year. The human brain, especially in its youth, is hard-wired to seek out the shortest possible route between A and B and take whatever risk is necessary to follow it. The adventure begins with a well-worn dirt path onto the asphalt of Summit from the privately operated student dorms and apartments along Dalgleish Drive and other side streets. Dodging cars and emerging on the other side of Summit, the student daredevils hike up an exit ramp that takes southbound traffic off Summit and onto the campus. That, in itself, is dicey. Each time City council considers building a pedestrian overpass there, the idea gets turned down. The current estimated cost is $3.5 million, and getting more expensive every day. Despite council’s past disinterest in the idea, staff is doing some design work in case senior governments make grant money available down the road. So the overpass question will come up for discussion at a council workshop on a new pedestrian master plan in a few weeks. Unless some minds are changed, it will get short shrift. There’s a much cheaper solution. Instead of an expensive overpass – which many students would ignore anyway – the City could build a fence. A similar issue on Tranquille Road at NorKam secondary was solved in exactly that way. An attractive wrought-iron-style fence was erected down the middle of Tranquille and students are now forced to use crosswalks instead of fighting traffic. A fence would cost in the neighbourhood of $250,000, less than a tenth of an overpass. 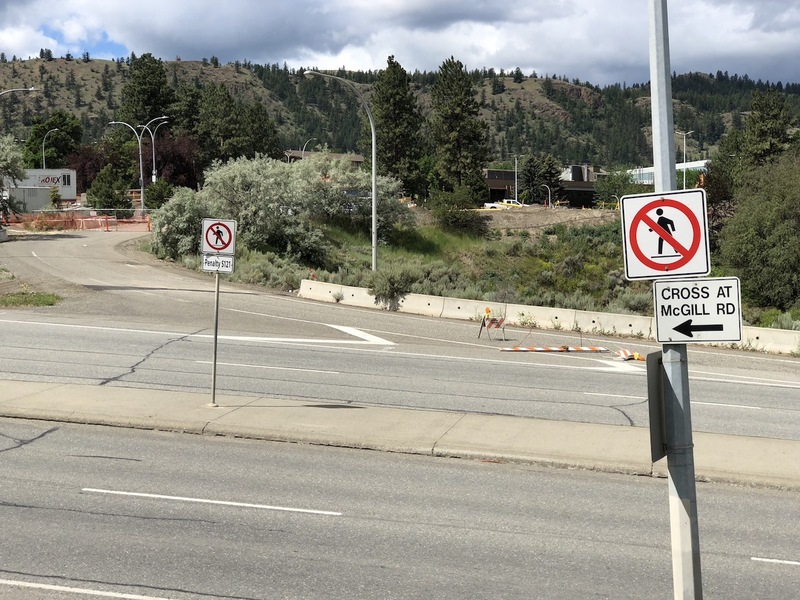 The City could also beef up the crosswalk at Summit and McGill to take the extra foot traffic that would be funnelled across it once the Summit Drive gauntlet is shut down. I’d like to take credit for the fence idea but it’s been around since 1993 when the City’s traffic advisory committee recommended one. The council of the day turned it down then because of cost, and it’s been turned down – along with the overpass – ever since. Theoretically, “education” and “increased policing” can get the job done. I’ve never noticed any kind of policing, let alone increased policing, on the Summit gauntlet. And the only education going on is of the academic kind at TRU. Five years ago, one of those who voted against a fence was Arjun Singh (Peter Milobar, a councillor at the time, also voted against it). Back then, Arjun suggested raising fines. Last week, on his blog, he wondered if a fence “might be a better idea” than an overpass. The Summit problem has been on the honey-do list, right under the now-finished Valleyview overpass, all those years. Engineers and planners dream of building an overpass that could be used by both pedestrians and cyclists. But if council can’t even bring itself to build a fence, it will be a long time before we see an overpass there, especially since TRU so far has declined all City overtures to share the cost. WOULD A FENCE COST LESS THAN 3.5 MIL? ALMOST ALL THAT RUN THE GAUNTLET ARE USED TO DOING IT IN THEIR NATIVE COUNTRY.FEW OF THEM ARE RIDING A BICYCLE. AW, LETS JUST BUILD THEM A FENCE. I,M SURE IT WILL COST LESS THAN 3.5,AND THEY WON,T HAVE TO CLIMB ANY STEPS. A properly designed overpass is the only way to go for that area. That area is very busy, destined to be busy, even busier, for centuries and there is much more to worry than university students. The general cycling population is destined to increase tremendously in the future thanks to e-bikes and this alone will push demand for safe commuting past some second rate opinions.